It’s one of those stories that you had to listen twice when you heard the report on the radio, and then, still in a state of suspended disbelief, I rushed to the internet to check and see if indeed it was the case. With the good news, I could just about hear a faint pulse of the American heart beating again. In Seattle, where residents laid seige to the Seattle Police Department’s plans to use surveillance drones, it appears that following Wednesday night’s Public Safety, Civil Rights and Technology Committee hearing – the program has been scrapped. Washington residents take away expensive new police toys. This news comes on the back of a week of controversy surrounding Obama’s CIA Director nominee, John O. Brennan, seen by many as a pioneer of sorts in the field of US military secret drone assassinations. This has presented an ethical dilemma for President Obama, who ascended to power on a liberal PR wave which is fundamentally at odds with this level of anti-constitutional and illegal policy. Obama himself signed the bill in early 2012 that enabled some 30,000 drones in the domestic US, to be operated by the Department of Homeland Security and local police departments, Seattle being one such city scheduled for adoption of a junior ‘Skynet’ beta program. Make no mistake about it – there is an Washington DC-based agenda to roll out drones all over the country. 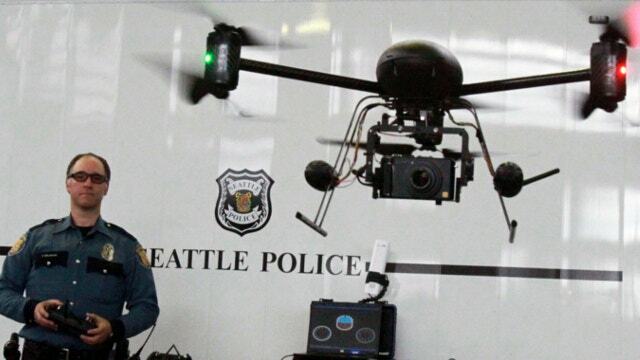 Seattle’s Police Department had obtained these two small drones through a federal grant. “The testimony opposing drones has been overwhelmingly clear that the 11 people who testified this afternoon, all of whom testified against the use of drones, was symbolic of the general reaction we are getting,” said Chairman Bruce Harrell. Compared to other direct actions, this was a relatively modest effort, which should encourage other citizen groups keeping the encroaching police state at bay – for now at least. Mia Jacobson who represents the citizen group StandUP explains, “If 11 voices can protect the people from flying government robots watching their every move – what can 20 voices do? What can your voice accomplish?”. In addition to Seattle, the city of Charlottesville, Va., also rejected drones by ordering a two-year moratorium on their use thanks to The Rutherford Institute, a civil liberties group. According to FOX news: the U.S. Department of Homeland Security drones do enter Washington State airspace occasionally, patrolling the Canadian border east of the Cascade mountains. The two 10,000-pound Predator-B unmanned aircraft are based in North Dakota.